Divers’ Lodge welcomes certified divers in Hurghada for a full programme of exciting Daily Diving activities. 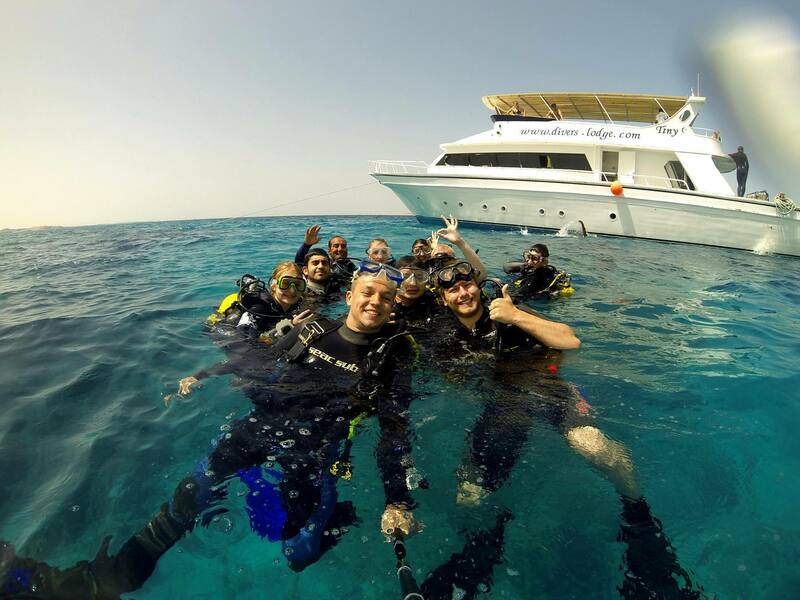 Whether you are a Recreational or Technical diver, want to experience some special trips, or just want to make some fun dives we can help you get the most out of your diving vacation in the beautiful Red Sea. Divers’ Lodge offers boat diving in Hurghada. Non-divers and snorkellers are also welcome to join us on our dive boats. We offer a range of special trips to particular sites of interest and can also arrange mini safaris and liveaboards for those wanting to add an extra dimension to their diving. Whether you diving with us for just one day or are here for a few days, Divers’ Lodge offer a personalised service and specialise in arranging tailor-made itineraries. Please contact us with details of your requirements and we will be happy to help you plan your trip. As one of the longest established names in Red Sea diving, Divers’ Lodge are perfectly positioned to ensure you have a great diving time. Our instructors and divemasters are supremely qualified and have all the knowledge required to show you the absolute best that this area has to offer. From outstanding reefs to exciting wrecks and deep blue discoveries… Divers’ Lodge will take you there. We offer a series of great value dive packages for certified divers and we accept certifications from all major international agencies including PADI, TDI / SDI, BSAC, CMAS and NAUI. Please ensure you bring your certification cards and logbook when diving with us. If you have not dived for 6 months or more we will require you to undertake a check dive. If you have not dived for more than 12 months, you will need to take a Scuba Review depending on your certification level and/or experience. For more information on Daily Diving with Divers’ Lodge and to learn more about our daily diving prices please do not hesitate to contact us.